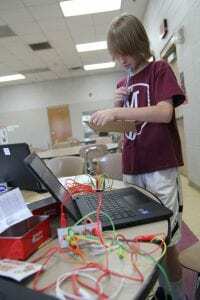 NASHVILLE, TN — Twelve-year-old Landy sits at a round cafeteria table and tapes pieces of copper onto the cardboard he has cut out in the shape of a video game controller. He connects wires from the cardboard to a small console. Then, he pulls up a game on his laptop and puts his fingers on the makeshift buttons. He is learning to use a combination of everyday items and a technology kit to play games like Pac-Man, Super Mario and others. “This is cool,” he says with eyes fixed on the screen. Landy is one of more than 100 middle and high school students in Davidson County who have engaged in a range of STEM (science, technology, engineering, math) programming from the YMCA over the past year made possible by Google Fiber. 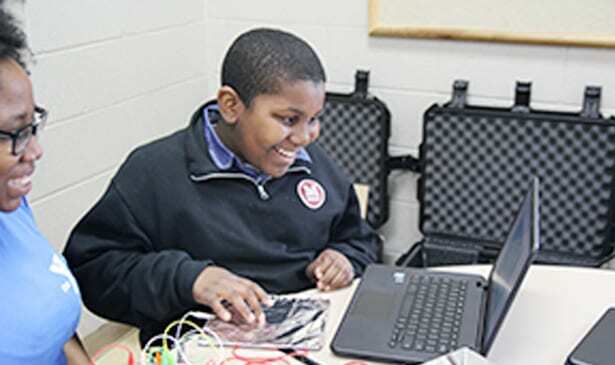 At YMCA Fun Company, the Y’s afterschool program, STEM clubs used mobile computer labs, underwritten by Google Fiber, for DIY projects like the video game controllers. The hands-on involvement of Google staff also gave students positive role models for careers in STEM workplaces. Landy is asked if he would have ever thought it possible to make a game controller out of such materials. YMCA staff member Olivia Gant says the kids quickly showed enthusiasm for the various projects, which are designed to let them take the lead. “I’m watching,” she says and looks at the game over his shoulder. Olivia’s encouraged to see the students embrace projects with so much educational potential. Caleb, 11, makes a larger, square controller covered in tin foil for the games he’s interested in. “I had no idea Play-Doh conducted electricity,” he says. Across the table, Justice shakes his bangs out of his eyes and asks for help drawing the outline of his controller on the cardboard. A staff member urges him to try it on his own first. By the end of the afternoon, Justice not only succeeds at creating a functional controller, but he also becomes an outspoken advocate for the project. The Y staff witnessed this wonder and excitement in students throughout the year in all the programs that benefitted from the Google partnership. High school students in the YMCA Community Action Project (Y-CAP) got the chance to engage in career-focused and skill-building workshops rooted in evidence-based STEM curriculum. As Y-CAP seeks to empower these youth to believe in and achieve their potential, the Google workshops kindled new interest in STEM subjects and helped young people envision themselves in STEM careers. Minority juniors and seniors in the YMCA Black Achievers and Latino Achievers programs were also introduced to STEM educational opportunities and careers through an intensive summer day camp. The Achievers program empowers youth by providing the resources and support they need to excel in high school, gain access to higher education, take advantage of scholarship opportunities, and find their career path. The success from this year’s Google-funded programs at Fun Company, Y-CAP, and Achievers—combined with the demand among students for increased STEM involvement—encouraged the Y to serve a greater number of youth in a fuller capacity. In 2018, the Y will expand STEM curriculum to additional afterschool sites, implement a year-round engineering project for middle schoolers, and enhance programming for minority students to consider careers in STEM. Google Fiber’s support of STEM enrichment programs strengthens the ongoing commitment of the YMCA of Middle Tennessee to nurture and develop youth. Each year, the Y offers a range of programs to help more than 78,000 local youth and teens learn, grow, and thrive.